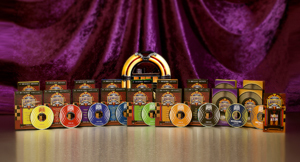 This 9 volume collection features the hit-makers from the 50's and 60's. 37 performers who created the music of a lifetime. It is the music you listened to when you were dating, the songs you heard while falling in and out of love, and the hits they played at the sock hop. This is the music of an era! It is YOUR music. Join us for the Rock and Roll Graffiti Collection to see and hear the stories behind the music and the songs of the 50's and 60's. The 9 dvd collection includes the free bonus series, “Backstage Pass,” a 2-hour look behind the scenes at the taping of Rock and Roll Graffiti. This is a once in a lifetime gathering. Enjoy! When you order the DELUXE package, you'll also receive the Rock and Roll CD version of the entire video series. We've put all the songs from the series on CD so you can listen to it in your car! Over 50 live performances including "Dizzy," "Stay," "Let's Go To the Hop," "Love Letters," "Stop In The Name Of Love," "Mashed Potato," "Sugar Shack," "Birds and the Bees," "Everlasting Love," "Patches," "Rock and Roll Is Here To Stay," "Little GTO," "One, Two, Three," "Little Darlin'," "I Love You More Today Than Yesterday," and SO MANY MORE!